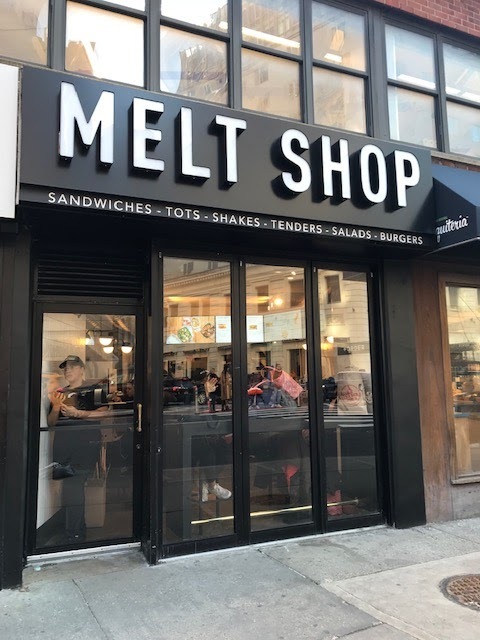 A Melt Shop has emerged at 135 Fourth Ave. between 13th Street and 14th Street. This is the fifth Manhattan location for the quick-serve restaurant that specializes in grilled-cheese sandwiches and tater tots. Signage for a Melt Shop was spotted here in June 2016, but the storefront instead became a Make Sandwich, which was an extension of the Melt Shop brand. Make shut down in December after nearly two years at the address. According to the Make website: "We’ll be closing the shop ... to look for a location that is more suitable for our craft. We’d like to thank you all for your support and sando love." So ownership decided to go with the more recognizable sandwich brand, choosing Melt over Make. Thanks to EVG readers Jeanne Krier and Sheila Meyer for the photos and tip! Melt may do better as a name (and concept), esp. in the winter months. But they did make a fine sandwich... by the standards of my taste buds.